Adobe, Amazon, Apple, Google, IKEA, Mars, and Microsoft: these are some of the leading businesses that took a historic stand for climate action and cleaner energy. Just days ago, these iconic companies filed "friend of the court" briefs in one of the most important legal cases over our nation's climate security—the litigation brought by coal interests and their allies attacking the Clean Power Plan. Some of the nation's biggest polluters are in court. And now, some of our nation's greatest innovators are there too—explaining their own efforts to invest in zero carbon clean energy, the bottom line business benefits of clean energy, and the importance of policies like the Clean Power Plan that reduce climate pollution and expand clean energy availability. Stand with them: Thank these leading businesses for standing on the right side of history. I'm writing today to thank you for filing a "friend of the court" brief in support of the Clean Power Plan in the U.S. Court of Appeals for the D.C. Circuit. The Clean Power Plan establishes the first ever national limits on the extensive carbon pollution from coal-fired power plants--the single largest source of climate-destabilizing pollution in our country and one of the largest in the world. We are in a race against time to address the climate crisis. The American people overwhelmingly support common-sense limits on the carbon pollution from our fossil-fuel fired power plants, and I am pleased to know your company stands with us. America's Clean Power Plan rests on a strong legal foundation, as states, power companies, legal experts and air pollution control officials across the nation have already recognized. The Supreme Court itself has repeatedly upheld EPA's authority and responsibility to limit climate pollution under the Clean Air Act--and found that the very authority EPA is relying on here "speaks directly" to the carbon pollution from existing power plants. But when voices like yours take a stand, it has far reaching reverberations as your voice, your expertise and your innovation prove that climate action is what's best for business, what's best for our economy, and that we can protect human health and our communities while ensuring prosperity. 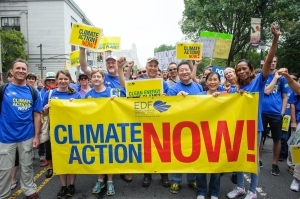 Thank you for submitting a "friend of the court" brief in favor of the Clean Power Plan. I am grateful to you for standing on the right side of history.